You will be excited to see the new elements we have included in TeamScan reporting. These new elements can help you to build more effective workgroups in your organization. The upgrades are all about giving you clearer, deeper analytics—leading you to better-informed workforce decisions. In the upgraded reports, you will find that every graphic is improved and delivered as a vector image. This means that there will be no loss of resolution when you project the report at any size or when including in your own presentations. Besides a name change from "Basic Traits & Energy," the Group Basic Dynamics report orders traits highest to lowest on the Highest Trait Distribution page and lowest to highest in the Lowest Trait Distributions page. In addition, each trait now has an identifying graphic. Notice that a new column has been added to the Highest and Lowest Trait Distributions. Previously, you only knew the percentage of the Highest and Lowest Traits. 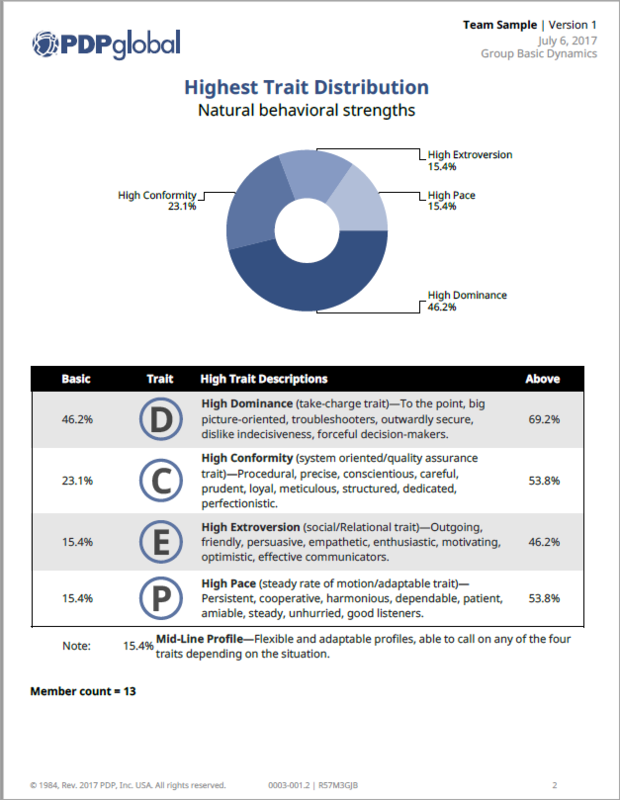 Now, we provide you with data on other high and low traits present within the group. Having this data at your fingertips provides you deeper insight into the culture of that team or organization. If you are new to PDP or a long time client but have not taken advantage of PDP's TeamScan applications, now is the best time check it out. See how team analytics can help your organization going forward. You will not be disappointed!